Sunset turned to Bose Professional and its RoomMatch speaker array products to keep the sanctuary’s reverberant energy to a minimum. Eleven RoomMatch modules compose the system, selected from the line’s 42 different combinations of horizontal and vertical dispersion patterns (which include asymmetrical configurations). The central RoomMatch cluster, above the chancel, comprises three modules that cover a central seating area and two rear, fan-shaped sections. Two arrays firing 90 degrees to left and right cover transept seating. A forward pair of arrays is aimed toward the rear corners of the sanctuary and covers the largest swath of main seating. The entire system, driven by three Bose PowerMatch® PM8500N networked amplifiers, generates a full-range SPL of over 109 dB averaged across the floor area. 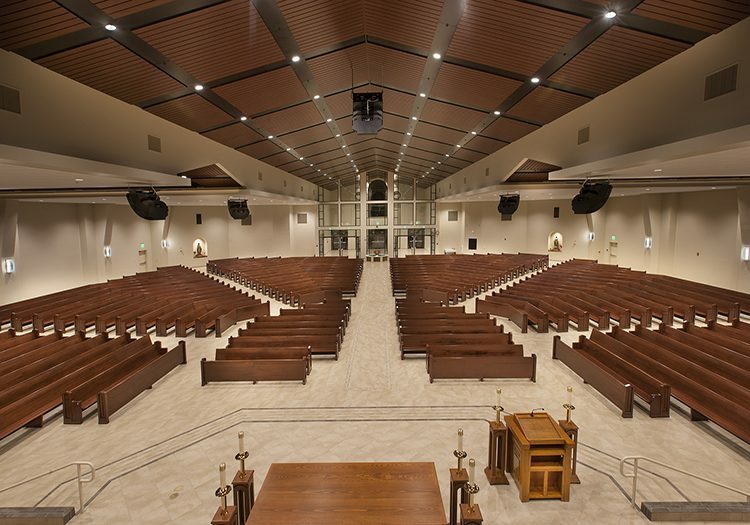 The new sanctuary presented some acoustical challenges for AV systems integrator Sunset Audio Visual of Upland, CA – challenges met and bested by the capabilities of a Bose Professional RoomMatch® DeltaQ™ system. The initial challenge faced was the church’s election to use tile flooring rather than carpet in the sanctuary to minimize maintenance. “Tile sends the sound all over the place,” explains Kojder. Sunset consulted with Bose engineers, who plugged the sanctuary’s dimensions into Bose Modeler software and developed a five-array design to direct the energy at the pews and minimize floor and wall reflections. Although the sanctuary is essentially square it echoes traditional church design with a vaulted nave and a crosswise transept. An early system design called for the arrays to be flown within the nave, but Kojder recommended that the two left and two right arrays be hung from the lower ceiling to either side. “We were able to put them in a place that is aesthetically pleasing and still achieve the same result, which was ample coverage of the entire church,” he explains.